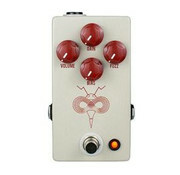 In the late ‘60s, the Fuzz Face burst on the scene, delivering the gritty tones that continue to change the world today. In a lot of ways, JHS owes a debt to these tones as they helped kick off the effect pedal revolution. The Pollinator is our tip of the hat to this Germanium fuzz circuit. In JHS Pedals fashion, we included a few major improvements while caring for the details that preserve the original’s legendary tone. If you are a fan of classic fuzz and the unique touch sensitivity, response, and tone that a true Germanium fuzz offers, the Pollinator V2 is a perfect fit.